Look good, and you’ll be merry. Gearing up for the holiday festivities require a few things: a big appetite and a merry mood, plus a bangin’ outfit to match. No doubt, each of the countless gatherings you’re bound to attend will be documented and immortalized via social media. And with only a few more days ‘til the most wonderful time of the year, we’re sure your schedule has been so packed, there’s hardly any time to plan a proper party ensemble. No worries, we’ve done the legwork. Below, we’ve put together a few looks from River Island to help you step up your game, effortlessly. When December hits and the cool breeze sets in, you just know, love is in the air. Whether you’re in a budding romance or already celebrating your fourth Christmas with your beau, date nights are so just so much more romantic this time of the year. Opt for something simple yet chic like a super comfy ribbed sweater dress, a versatile clutch, and dainty steppers. 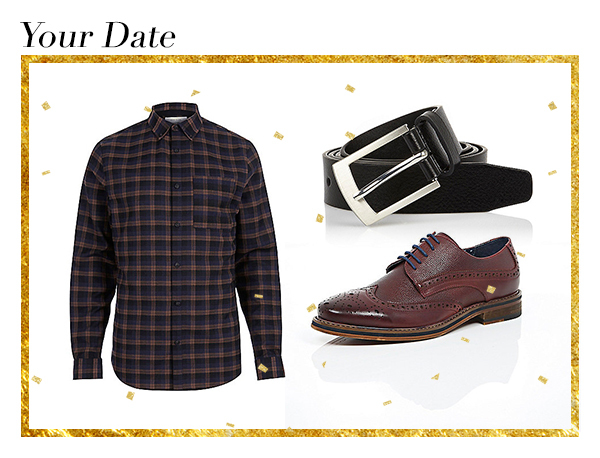 As for your man, a slim-fit shirt and some brogues would make him the perfect arm candy. It’s that one time of the year when you can be chummy with the boss so you need an outfit that’s fun but still work-appropriate. Instead of your usual button-down, go for an embellished top, then pair it with a skirt and party-ready fringe heels. For wine night and a bit of dancing with friends, you can’t go wrong with a mini bodycon. An unexpected pop of pink matched with some strappy steppers should do the trick. This year, don’t go for the obvious red or green for Noche Buena with the family. A graphic white body-hugging frock will make you look fresh all night-long, not to mention stand out in group photos. 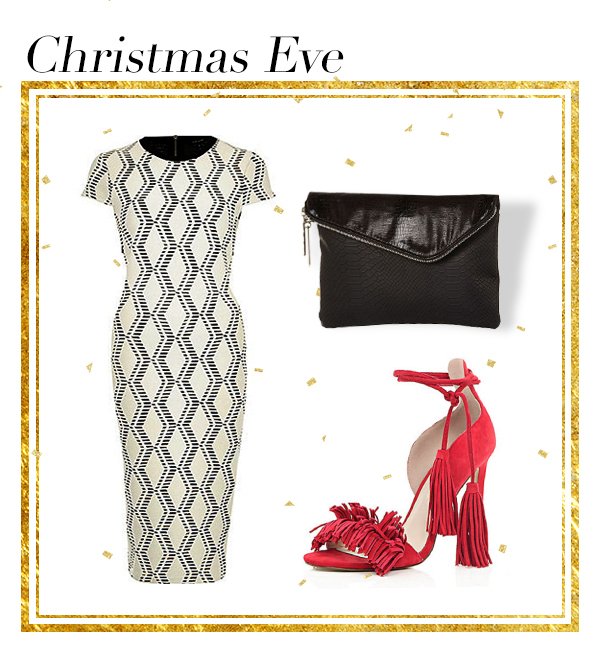 Then complete the ensemble with a hint of festive red via your heels. Everyone fashion girl knows going all out with your look is the true New Year’s Eve tradition. It is, after all, the attire you’re ringing in a new year with. We suggest a maxi dress, made sultry with a thigh-high slit that will show off not just your gams, but your tie-up steppers as well. Cheers to a stylish 2016! All the pieces are from River Island. Stores are located at Mega Fashion Hall, SM Aura Premier and Glorietta 5.